The story of our experiences on the blue line will all have some common themes, I’m sure. I don’t see anything special in mine, though I know there were some unique things that I experienced. But none of them were as wonderful as crossing that finish line, greeting Anne Bitong right away, then heading off to get that half marathon medal that some people might think of as a worthless trinket – though one I will always consider one of my most valued possessions. So let me tell you about how I got there. After taking pictures with the Children’s Champions, I headed over to meet up with our Blue Line Beginners at the Beacon Journal’s parking lot. I shared some camaraderie with new friends, gave a hug to our fearless leader Paula, then we headed to the starting corrals. A few of us figured out pretty quickly that we must have filled out the entry form incorrectly because we were in Corral D when our typical paces would have more appropriately had us in the middle of Corral C. But ultimately that really didn’t matter much. As we finally got started, I was feeling tweaks in my ankles. I’ve had problems with my Achille’s tendons for the last 1.5 years, ever since I got a partial tear in my left Achille’s. Sometimes they are ok, sometimes not. I even took a special precaution by having someone at the Health Expo the day before tape up my ankles. They said it would help, and it did. The day before the race my ankles felt a lot more stable. But not so on race day. A half mile in, I started to feel sharp pains. They would come and go. The ankles never stopped hurting, but I was doing reasonably well ignoring the pain and powering through. In the meantime, as I was running across the Y Bridge trying to keep Bob Gill in my sights (and failing miserably as he was in rare form and zipping along at quite a clip), I remembered the pictures I had seen on Paula’s blog of the masses of people running the bridge. I forced myself to look forward and backward at all of the people. Never in my wildest dreams had I ever expected to be participating in something like this. It was an overwhelming feeling being in the middle of this huge crowd – but also seeing that I was actually passing a lot more people than were passing me. What a cool feeling. That changed as we worked our way toward Cuyahoga Falls Avenue. I had to force myself to slow down so that my feet wouldn’t fall off. As we ran down that road, and I remembered my days as a kid coming on the Metro to visit with friends who lived in North Hill. I knew that I would be coming up soon on one of the highlights of the race – the milkshake station at Swenson’s! I grabbed a strawberry shake but before I could raise it to my mouth, the person handing them out accidentally smacked my hand and I spilled half the darned thing. It took me the next four miles to work up enough sweat to get the stickiness off my hand, but that little bit of heaven sure felt good going down my throat! Running up Gorge Boulevard was relatively uneventful, with the slight exception being the long hill. It took a toll on me. Hills are my real Achille’s heel, particularly when my ankles are hurting. I had to walk part of the hill, but then we worked our way back over the Y Bridge. I got my second wind. I knew that shortly after the end of that bridge was the end of the first relay leg. Since I was doubling as a Team Relay member for Leg No. 1, I had a bracelet to hand off to one of my associates at Bober Markey Fedorovich, Christa Seikel. I didn’t want to let her or the other members of my team down, so I found myself accelerating over the bridge despite an incline. Ultimately, I handed off to Christa in a respectable 10:30 average pace. Christa is in her mid 20s and was a runner in school. She took off like a bolt and I lost her within mere moments. I later learned that while I averaged a 1-minute mile pace in that second leg of the relay, she was averaging 8:15. I reminded myself I was in my mid 50s! As I made my way through the University of Akron down East Exchange, I was running out of steam. I defaulted to a running and walking sequence. When I turned onto Brown, I knew I’d be seeing my work associates who were volunteering at a water station. I sped up, not wanting to pass them while walking or showing how worn down I was. Their water station ended up being at the far end of Brown, but I ran past them while waving a big hello to all my BMF associates who were wearing the same bright orange shirt as was I. They knew me before I’d lost all my weight. They knew me as a couch potato who never did any exercising. So they also knew this was a really big deal for me. What a great moment for my ego! As I continued up Brown toward Firestone Boulevard, I caught up with fellow BLBer Jim Mitchell and we ran together for a short time. That’s when we spotted something that surprised me: A big sign on the side of Firestone from Akron Children’s with my name on it as a Children’s Champion. Jim was ready for a quickie break and he was glad to snap a photo of me with the sign. As we continued through Firestone Park, I remembered a Beacon Journal blog about the Marathon returning to the neighborhood for the first time in two years and how much it meant to the residents there. Several times I yelled out, “We love you Firestone Park!” Each time I got a loud roar of applause in return. I came across another friend running, Sylvia Trundle, and we reached one of Firestone Park’s most famed features in the race – the marshmallows. Yes, someone shoved 3 marshmallows into my hand, and yes I took them and ate them all over the next two miles. Others I was with didn’t take them because they thought they would bloat them, and maybe if I ate them all at once that would have happened. But I took my time and thought they were just fine. I was just at the point where I needed a sugar buzz! After turning onto South Main Street, I’d forgotten that there are not only one but two hills that are deceptively long and kind of a pain in the neck. I really lost steam on those hills, and that is where Jim Mitchell separated from me as he was better at powering through them. I was really starting to feel the burn at that point, but I could also see the skyline of downtown and knew I was in the homestretch. I kept powering through. As we moved into downtown I noticed more people passing me. I started getting aggravated that I was going so slow. When I hit the parking lot where our two previous trial runs of the course had stopped, I knew I was close. But that run to Mill Street, down Mill to Main, and Main to the ballpark was a lot longer than I thought it would be. I was huffing and puffing, pushing myself to the finish line, but I was completely out of steam. That is when the crowd really started to impact me in a positive way. I heard several people yell at me, “You can do it, Jim!” and “You’re almost there, Jim.” I’m thinking to myself, “Do I know this guy or that lady?” And then I remembered my name was on my racing bib! Those strangers really gave me that last push I needed. As I ran down the backside of Canal Park, I took off my sweat-soaked hat and turned it backwards so that I could see the finish line clearly. When I ran through the home run wall and into the home of the Akron RubberDucks, I really felt the emotions overcome me. I had accomplished something I never expected, finishing a half marathon. I have no idea if I will ever try to do something like this again. Right now, I don’t even care. I’ve gone 54 years with the knowledge that I was as far from being an athlete as one could get – but no more. Like LeBron says, nothing is given, everything is earned. Well, I earned that medal, and knowing that I did it with my new friends in the Blue Line Beginners made it all that much more special. One last note: A friend of mine has run several marathons and is training for another one next month. He ran the full marathon this year, and he was dead last among the men who ran (7:07). Well guess what? He’s 67 years old, felt like crap because of the conditions, but there is absolutely no quit in him and he took the marathon at a pace that he could handle. He feels absolutely terrific that he was able to get through the whole thing. By the time he got to Canal Park, there were two people left there to greet him – Akron Marathon founders Steve and Jeannie Marks! They always wait for everyone and true to their word, there they were! Before this year, the Akron Marathon never meant anything more to me than being a day of the year when a bunch of roads close and it’s difficult to get around the city. Now this day will forever represent a holiday to me, Akron’s greatest day of the year. 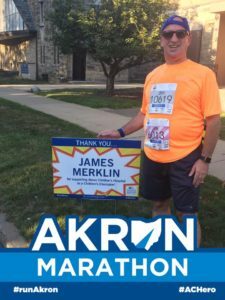 The race is not only professionally managed, the Akron Marathon staff has never forgotten, even after 15 years, their own humble beginnings and they make sure it’s a special day for every single runner. For me, and for all of our BLBers!